Home >Network Simulator Labs>Configuring a Router for MPLS Forwarding and verifying the configuration of MPLS forwarding. 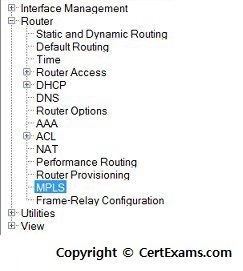 Configuring a Router for MPLS Forwarding and verifying the configuration of MPLS forwarding. Description: MPLS forwarding on Cisco routers requires that Cisco Express Forwarding be enabled. This lab exercise demonstrates the necessary commands to enable the Cisco Express Forwarding. 3.Enable the Cisco express forwarding on the router. 2. Select MPLS from MPLS properties list and click Edit button. 4. 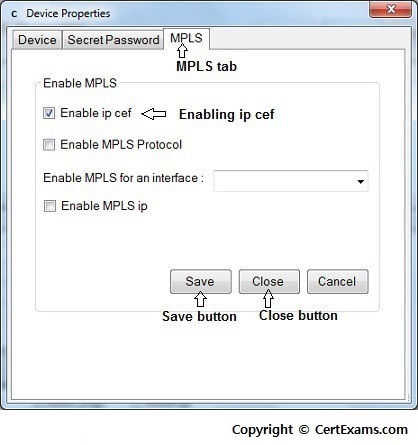 Click enable ip cef , click save button and close button.